BNIB | What Does BNIB Mean? BNIB (Brand New In Box) is most commonly seen on sites such as eBay and Gumtree or in classified advertisements in newspapers. BNIB describes an item for sale (usually an electrical item) that has never been used and still has its original packaging. BNIB contrasts with�BNWOT (Brand New Without Tags), which denotes that the item (usually a piece of clothing) is new but has had its labels removed. BNIB is similar to BNWT (Brand New With Tags). Sometimes, BNIB might mean "fairly new and still in its original box". 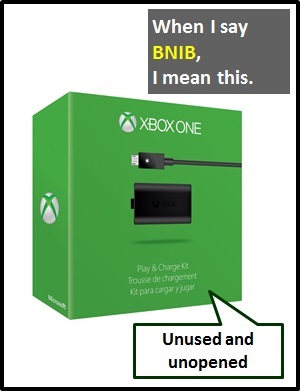 However, BNIB is meant to mean "unopened and unused". Before the digital era, we might have said something like "unused and still in its box" instead of BNIB.